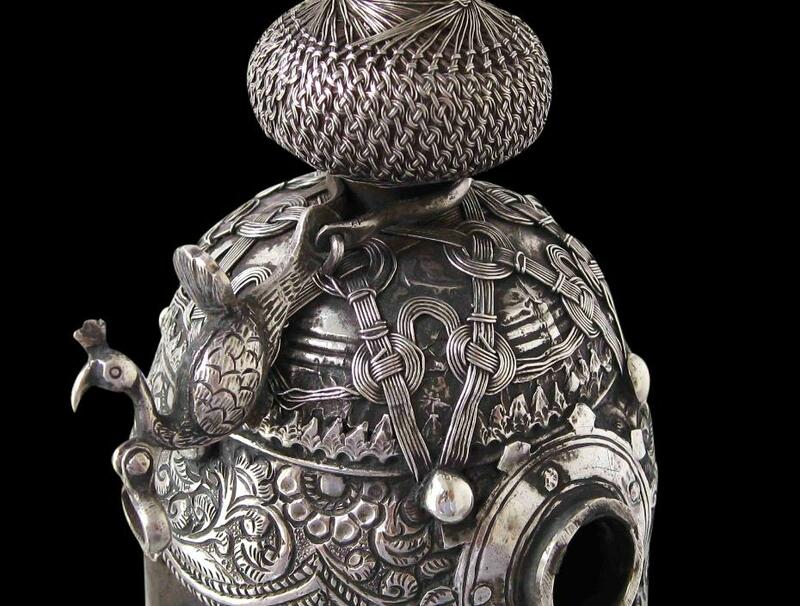 This hand-held water pipe or nargila, the portable version of the hookah or huqqa base, has a cone shape based around an elongated coconut shell over which elaborate silver mounts have been applied. 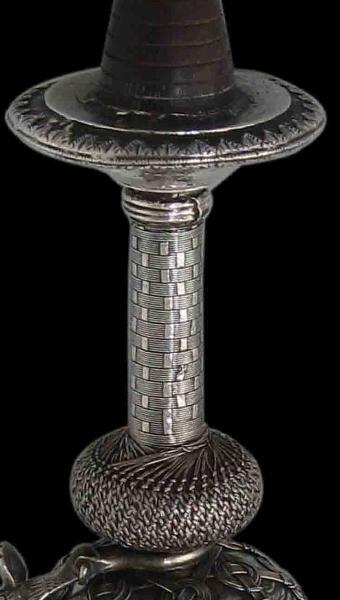 The silver mounts comprise both chased and engraved silver with open-work and elaborate woven silver wire work, particularly on the shoulder of the base and along the stem which leads to a turned wooden top into which the receptacle for embers would have been screwed. The base is fitted with a silver pendant lower end which is chased with bands of floral and leaf motifs. 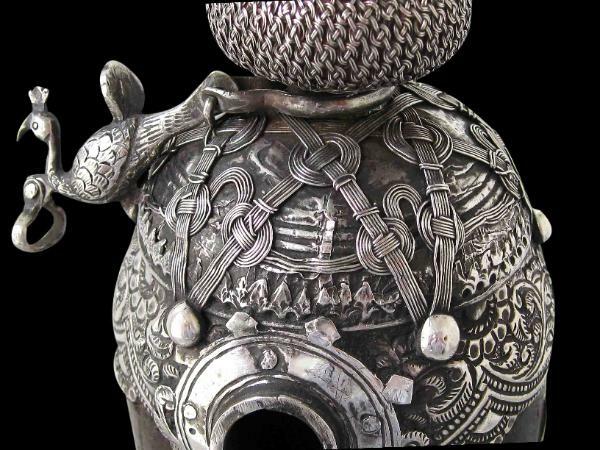 The nut is further embellished with three engraved silver fish-shaped plaques. A flexible pipe from which the smoker would have inhaled the smoke would have been attached to the central hole in the nut. 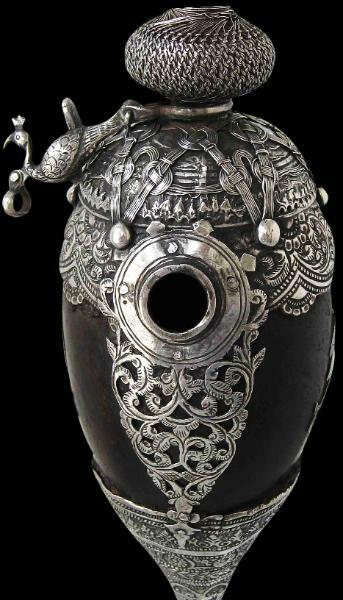 A cast and engraved silver peacock is attached to the base by means of a hoop or ring. In turn it has a hoop and it is likely that its purpose was to steady the pipe that would have been attached to the central hole. Mobile hookah bases such as this were designed to be held by the smoker or his servant and became fashionable from the seventeenth century onwards. Zebrowski (1997, p. 238) shows two illustrations, one dated 1795 and from Hyderabad, and the other dated 1662 and from Bundi, Rajasthan in which princely figures are portrayed using hand-held hookah bases of a form similar to this example. This form of hookah base also is encountered in Persia. Overall, this is an elaborate and highly decorative item. It comes with a custom-made stand and is displayed upright on the stand.